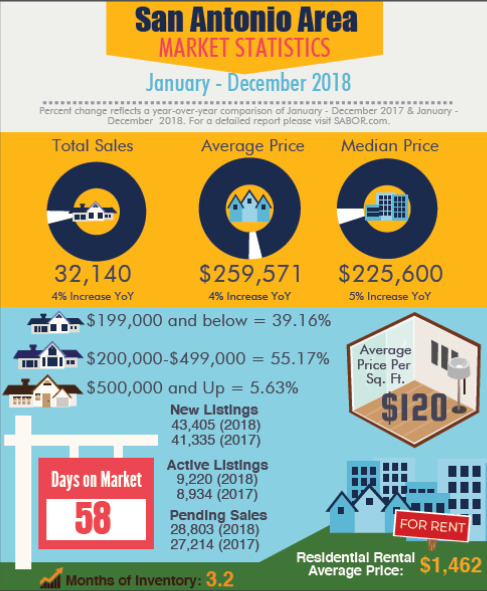 San Antonio area home sales figures have continued a steady incline all year, with 2018 reporting 32,140 homes sold, an overall increase of four percent from 2017 according to the Multiple Listing Service Report from the San Antonio Board of REALTORS® (SABOR) which reports on all areas contained within the MLS. The average sales price of a home in the area also increased four percent year-over-year to $259,571 while the median rose five percent to $225,600. Both numbers have remained over $200,000 all year. Every month except two (September and December) this year reported a year-over-year increase in total sales, with the most significant increase occurring in April with a 17 percent jump. Inventory continued to favor sellers, with months of inventory reaching its lowest in both January and December at 3.2 months. At its lowest, days on market fell to just 49 days in July while on the high end February reported 69 days on market. Homes priced between $200,000 and $500,000 made up 55.2 percent of the sales in 2018, a 5.4 percent increase from last year. Meanwhile homes priced under $200,000 accounted for 39.2 percent of the year’s market and homes priced over $500,000 accounted for 5.6 percent of the year’s sales. Even though prices have risen, San Antonio’s housing market continues to be among the most affordable of the large cities in the state. That affordability combined with job growth across many industries like tech, medical and military make this a desirable place to buy and sell property.